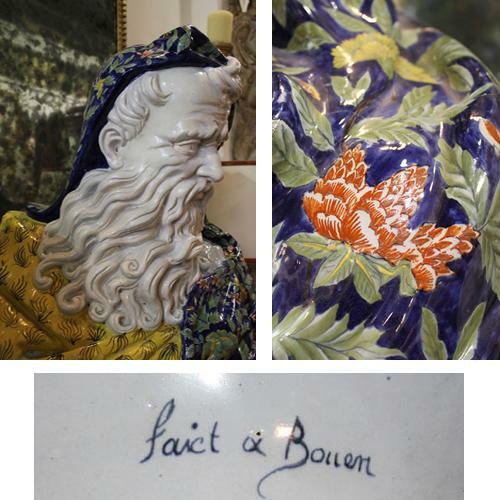 A Magnificent and Rare 19th Century Faience Porcelain Bust of "Winter" - C. Mariani Antiques, Restoration & Custom, San Francisco, CA. 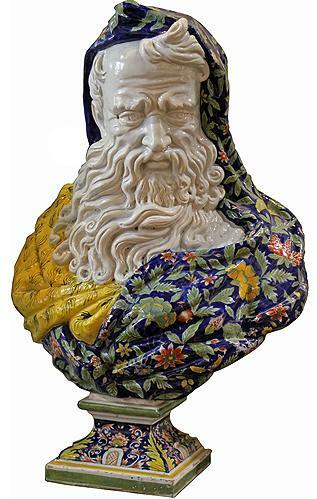 A Magnificent and Rare 19th Century Faience Porcelain Bust of “Winter”, a masterpiece of modeling from a series of five enormous faeince busts originally commissioned in 1730 from the Rouen manufactory of Nicolas Fouquay. The theme was Apollo overseeing the Four Seasons. The original Apollo is now in the Victoria and Albert Museum (London) with the Four Seasons busts including this original piece of “Winter,” are the Louvre. None were signed. This piece, commissioned in the mid 19th c., perfectly duplicates the size and vibrant colors of the Louvre original. Other copies are either smaller and/or not in the original vibrant multi-color palette as this piece (most after the original are smaller and typically in a subdued blue and white palette that is not true to the original). Height 30 1/2"; Width 22"; Depth 12"